As a 5-year-long user of Google Analytics, there is one feature I have eagerly awaited: real-time data. For those who do not remember, Google actually acquired a company named Urchin in 2005 before making this website tracking technology freely available to all. Competitors including Clicky, Chartbeat, Reinvigorate, Woopra, and a few others have long offered real-time tracking — Google is technically a bit late to the game. Users of Google Analytics generally have to wait a few minutes, hours, or a day to see new data appear in the dashboard, but the new real-time feature makes it possible to monitor activity as it happens. For instance, website owners can keep an eye on incoming traffic for a new campaign from the moment of launch and take steps to increase engagement rather than merely viewing results after a flood of traffic passes. It also helps to ensure marketing campaigns are properly configured. With real-time information, it would be easy to identify a link pointing to the wrong landing page and quickly begin directing traffic in the right direction. The new dashboard will even take advantage of social media tracking and help identify incoming visitors from social networks such as Twitter. Those looking to get their hands on the new real-time dashboard can sign-up with this early access form here. Some select users already have access and all Google Analytics users will gain access to the service in a few weeks according to the official announcement. 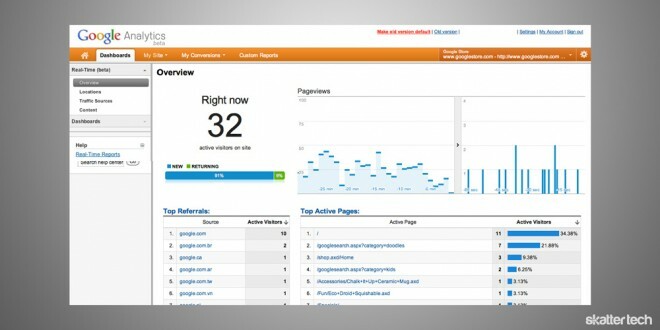 Though definitely not catered for the average user, Google Analytics Premium also made a debut earlier today. The enterprise-oriented service will offer extra processing power for high traffic websites, deeper data analysis, 24/7 support, and up-time guarantee. Google did not publicly disclose pricing and encourages interested companies to reach out to their sales team directly, but I hear pricing is over $100,000 per year.